We have long known that flares from the sun affect various technologies including satellites, communication systems and power grids. But it now seems that GPS navigation systems - whether used in cars, aeroplanes, ships or for other uses such as money transfers - don't like solar flares either. Scientists at the National Oceanic and Atmospheric Administration ( NOAA ) observed two powerful solar flares in December last year. 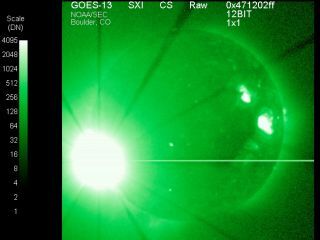 The flares were followed by a huge radio burst that knocked out virtually every GPS receiver on the sunlit side of the planet. Some receivers had a reduction in accuracy while others completely lost the ability to determine position, NOAA said . The radio burst produced 20,000 times more radio emission than the rest of the entire sun, scientists at the New Jersey Institute of Technology said. "The size and timing of this burst were completely unexpected and the largest ever detected," an MIT researcher said in a NOAA statement. "We do not know how often we can expect solar radio bursts of this size or even larger." Even space agency NASA is on the case. Late last year, it launched two twin robots that will map the geography of the sun and monitor coronal mass ejections. The space agency hopes that better understanding of solar storms like the one late last year will help "mitigate their effects on astronauts in space, as well as our satellite, communications, and navigation systems". Protecting GPS and other systems from sun flares it not easy, Paul M. Kintner Jr, professor of electrical engineering at Cornell University , said in a statement . There are two possible ways to shield GPS systems, he said, both very expensive. Either all GPS antennas can be altered to screen out solar signals, or all the GPS satellites can be replaced with ones that broadcast a stronger signal. That's why it's essential to learn more about the sun's behaviour quickly in an effort to find ways to predict such events in the future, the researchers said.